Last month, I had the honor of being appointed to represent the residents of District 3. I have lived in Surprise for eight years with the last two years in District 3. I was appointed to the Surprise Municipal Property Corporation Board earlier this year and through my city service, I have been part of numerous Community and Recreation Services events. I have lived in Arizona most of my life and I hold a Bachelor of Arts in Political Science from Arizona State University. Go Sun Devils! I look forward to meeting you and serving you in this capacity. Together, we have a mutual passion for this city and a desire to see it succeed! I hosted my first D3 quarterly meeting on Tuesday, October 24, at the Sierra Montana Recreation Center. For those of you who were able to attend, thank you! For those of you who were unable to attend, I wanted to be sure you received the same update. It’s a fact that Surprise is one of the safest cities, but did you know it is one of the fastest-growing as well? Residential growth aside – the City of Surprise has also been growing jobs and services! 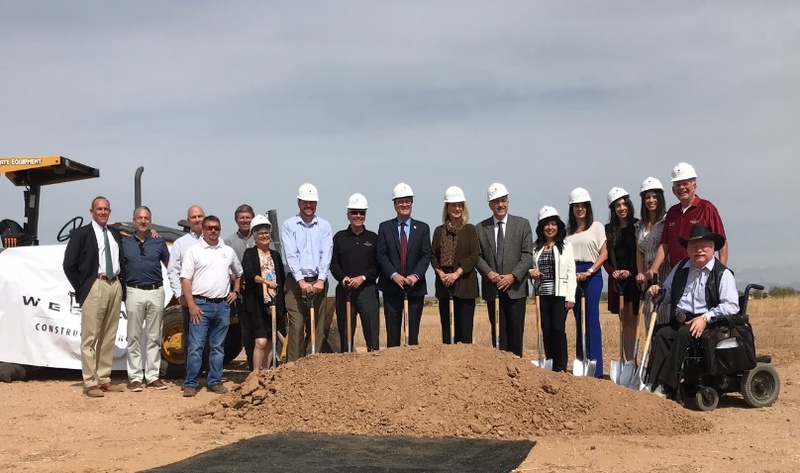 More than a million square feet each year of non-residential – including retail, commercial, industrial, medical, education – buildings have been constructed in Surprise each year for three years in a row. For a relatively young, new community, Surprise has come a long way – from a population of only 7,122 in 1990 to 132,677 today (Source: US Census). Much has been accomplished in recent years, and many more opportunities are ahead for us. 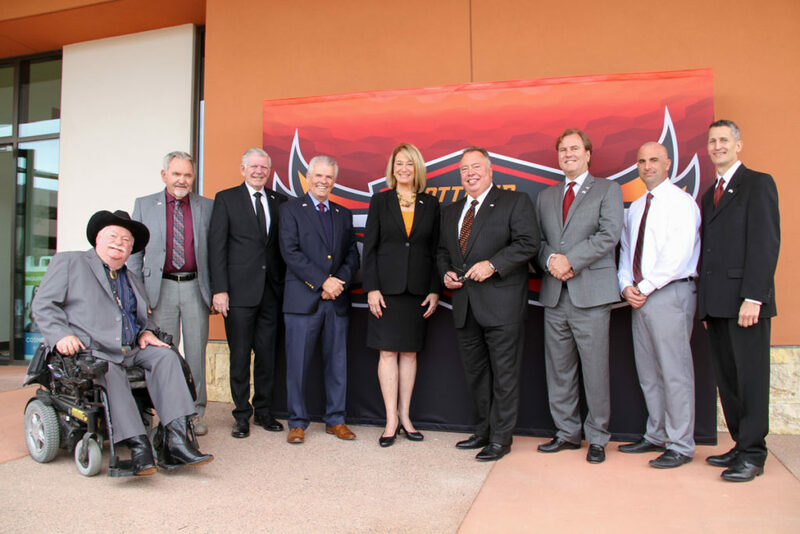 This year, Surprise officially transitioned from a bedroom community to a university town with the February 2017 announcement of the new residential campus of Ottawa University, located at Surprise City Center next to City Hall! 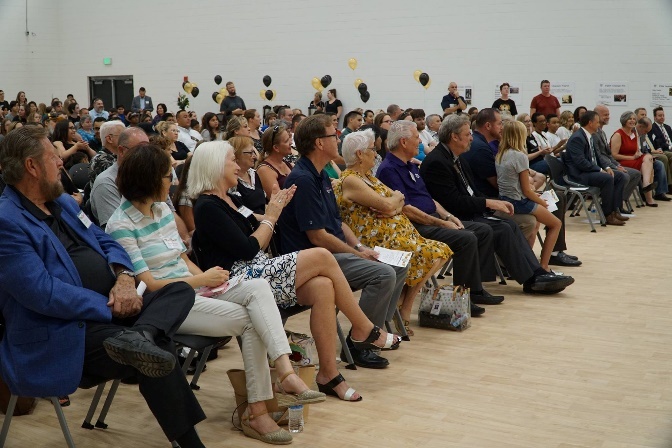 Their first class welcomed 434 enrolled new students, many of which are involved in the 21 intercollegiate athletic teams on the new campus. 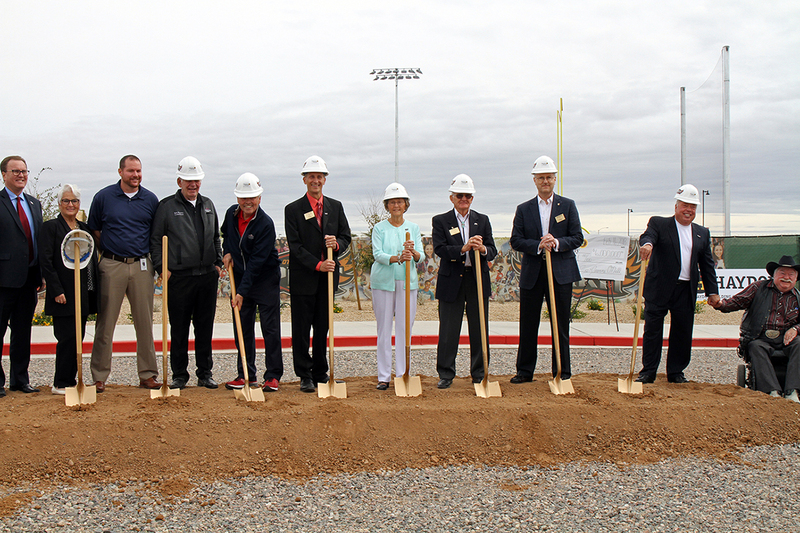 The new athletic field has been constructed, and their first phase of construction on an initial 13 acres of land is in progress. The school plans to grow to more than 3,000 students over the next 10 years. Shop Local Campaign Kicked Off! In September 2017, Surprise City Council approved a pilot program with the Surprise Regional Chamber of Commerce to deploy a citywide “Shop Local” program based upon the best practices of the 2016 award-winning “Shop Bell and Grand” digital marketing campaign. Starting next month, those who opt into the citywide program by texting the word “ShopSurprise” to 85100 will receive digital discounts for restaurants, services and products throughout the City of Surprise. The program will launch in time for the holiday shopping season. Mark your calendars from 5 -7 PM on December 7th, when the City of Surprise business incubator, the AZ TechCelerator, located at 12425 West Bell Road, celebrates its second annual “Tech the Halls” event! Meet the innovators growing their businesses, play games, enter to win ‘tech’ raffle prizes – and check out the space that offers entrepreneurs in Surprise a place to grow their dreams. The AZ TechCelerator has assisted the direct creation of more than 250 tech jobs, 32 new businesses, and two of the most successful incubator graduates in Arizona. Flagship telemedicine startup MD24 House Call graduated into 15,000 square feet of office space in Surprise and employs more than 150 people. Additionally, the first AZ TechCelerator tenant, Athena Wireless, was acquired by Google; Athena’s founder is now mentoring a second venture at the AZ TechCelerator called Me On A Bike. 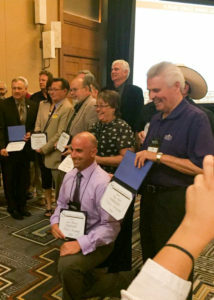 The Global Chamber of Phoenix awarded Surprise the Global Business City of the Year distinction this year because of the city’s international economic development strategy in place to attract companies, in addition to wins to the city like Ottawa University, IRIS USA, and Rioglass Solar. Medical project growth is on the rise in Surprise! 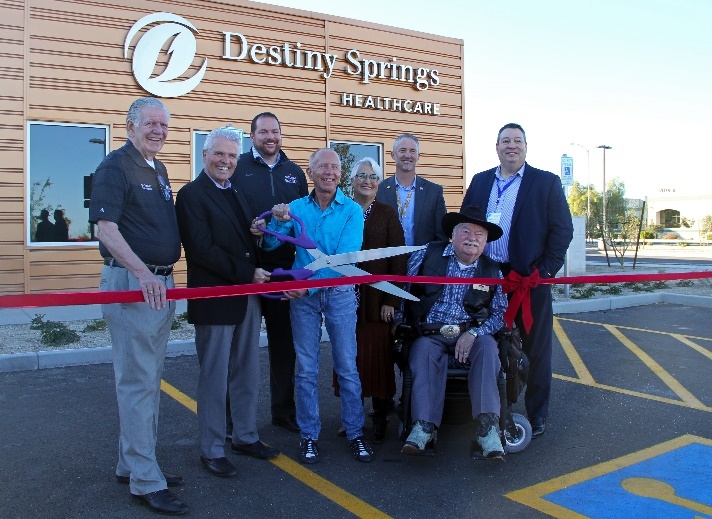 Just as Mainstreet Rapid Recovery Center cut the ribbon and opened their doors to their new 100-bed facility this month, Destiny Springs Behavioral Health Hospital began construction on its new $25 million facility near Dysart Road, north of Bell Road, not far from the new Cobalt Medical Rehabilitation Hospital. Additionally, the new Banner medical building located at Statler and Litchfield Road is almost fully leased. 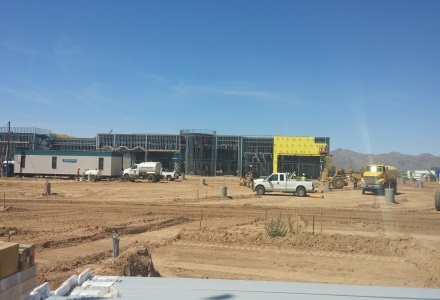 Advanced Manufacturing Growth: At the Southwest Rail Plex, where four companies call Surprise their headquarters, Milam Glass is nearing completion of their 22,000 square foot office/warehouse building, which broke ground in May of this year. While the Surprise Economic Development Department actively markets the rail-shovel-ready land sites remaining in the advanced manufacturing park for new ground-up operations, four buildings of new speculative industrial space totaling almost 200,000 square feet are currently under construction for those businesses looking for existing space. 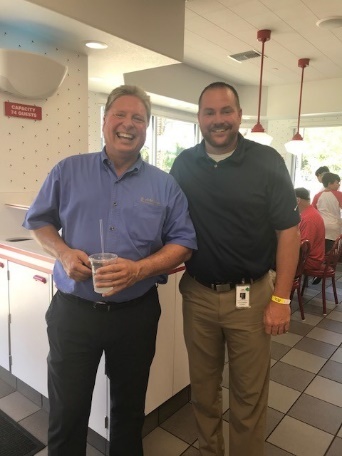 Coming Soon: At City Center on Bell Road, watch for In-N-Out Burger (the City’s #1 most-requested Surprise restaurant! ), in addition to Tokyo Joe’s, Starbucks, Menchie’s, Piology, Raising Canes; at the Stadium a new Hilton Garden Inn has submitted plans for construction. At the Bell Road/303 area, a Cornerstone Car Wash, and restaurants Hayashi and Sonic. Also check out Surprise Comics at Cactus Road and Reems as well as Scooter’s Coffee, which is under construction on Bell Road east of Grand Avenue. The Surprise Most Wanted: The Surprise Economic Development Department continues to pursue all most-wanted retailers voted as most desired by the residents of Surprise – including Costco and Hobby Lobby! Additionally, the team in Surprise announced on October 23rd that it had submitted a proposal along with a video to attract the most-wanted-employment-project-in-North America, the new $5 billion Amazon second headquarters project. Community Development Director Eric Fitzer provided attendees of my meeting with an update. You will begin to see even more development in our district. It’s an exciting time to live in D3! The Prasada Toll Brothers development preliminary plat just completed second review and the Minor PAD Amendment is in review. This project consists of 792 acres in 10 phases with a total of 2,350 lots. Phase 1 will consist of 459 lots. This development, planned in the Prasada area along the 303, is set up to accommodate a Master Plat and subsequent lotting plats as the market dictates. Carsense Automotive, a pre-owned auto dealership is in concept review. Once approved, it will be located on the vacant lot adjacent to Toyota. Another preliminary plat located at 175th & Sweetwater is in rezone review with the city. The preliminary plat includes 44 single-family lots on 10 acres. Heritage Farm, a development at the southeast corner of 175th & Waddell, is under review. This development will require a zone change. It includes 137 lots on 33 acres. We have a development in review that is located at the northwest corner of Cotton & Sweetwater – North side of Sweetwater from Cotton to 175th. This development will include 240 lots on 63 acres. Highland Prep Academy, which is located at the northwest corner of Reems & Hearn has completed its first phase of construction. Their second phase is under review. The Zanjero Trails development, located in the southwest corner of Peoria Avenue, east of Perryville Road continues to move forward. 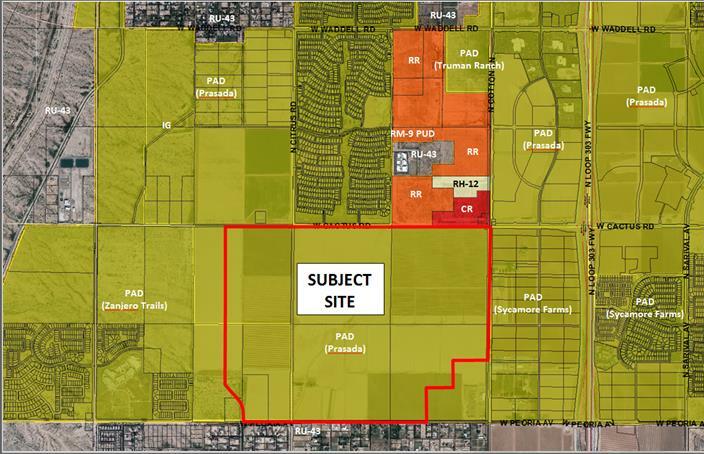 Several parcels have been platted in the vicinity of the Shadow Ridge High School on Peoria Avenue. Builders such as Beazer, Woodside, and Meritage Homes have model home complexes in operation and several under review. In addition, south of Cactus, several parcels are under review for final plat. Richmond American Homes is in for review for home product and model home complex. 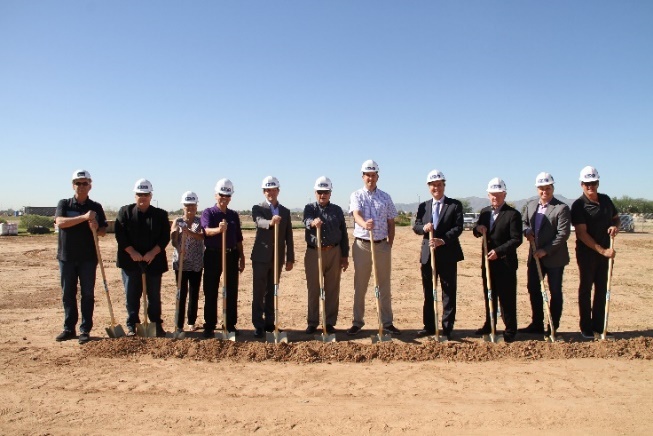 Acoma Court development is located at the northeast corner of Acoma Drive and 159th Avenue. The home product and model home complex are being reviewed on this infill residential development. Greer Ranch, located east of Sarival Avenue and south of Cactus Road, continues to expand. Taylor Morrison and Richmond American Homes are in for review for home product and model home complex. Retreat at Sycamore Farms, located west of 165th Drive and South of Cholla Street, has a model home complex open by Richmond American Homes. Currently the city is developing the Walking and Biking Map for each individual Dysart Unified School District (DUSD) school which includes Sonoran Heights and Sunset Elementary. This project will also combine all the maps into a citywide walking and biking map that can be utilized online or printed. Below you will find the Safe Routes To Schools (SRTS) grants for Sonoran Heights and Sunset Elementary schools. We will begin encouragement efforts and the SRTS study for Sonoran Heights early next year. The Sunset Elementary efforts will begin in January 2020. Each plan will work with the individual school and include participation of parents, students and DUSD staff. The city is at a crossroads when looking at the growth and presence of visual art and cultural events and how they will influence our city’s future. The community is invited to help shape the city’s first Surprise Arts & Culture Master Plan. The plan will provide strategic direction for arts and culture in Surprise including topics from public art to performing arts, festivals, and music. All residents are invited to take our online survey, which helps focus and clarify the public input for the Plan. The survey can be found at http://www.surpriseartsplan.com/ and it closes October 31. The next formal community outreach will begin in January when the first public draft will be distributed and discussed. Pavement preservation in District 3 and around the city continues, with Spring Lane, Verde Vista Drive, and Acoma Drive within the Sierra Montaña neighborhood scheduled for resurfacing in the next few months. Almost every road in the Sarah Ann Ranch neighborhood is scheduled for treatment next fall (2018). All of the traffic signals on Bell Road are undergoing a hardware upgrade as part of a multi-agency Adaptive Signal Technology project that will allow greater synchronization and optimization of traffic flow on Bell Road between the western city limits of Surprise all the way east to Scottsdale. The Bullard Avenue Traffic and Pedestrian Safety project is scheduled to begin construction in May 2018. 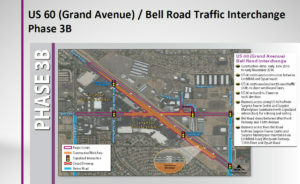 This project will resurface the entire roadway between Greenway Road and Peoria Avenue; add a second vehicle lane in each direction; install a landscaped median between Greenway and Waddell roads; modify the existing median between Sweetwater Avenue and Cholla Street; install a buffered bike lane in both directions between Greenway Road and Peoria Avenue; and install full traffic signals at the Acoma Drive and Sweetwater Avenue intersections. Less than 6% of the total costs of this project will be paid with local tax dollars. 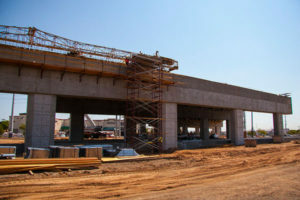 Candidly, the proposed traffic congestion mitigation projects in the bond election issue do not resolve all of the necessary transportation improvements in the City of Surprise. In preparing the bond proposal, City Council and city staff gave careful consideration to the priority needs, the project costs and the impacts this secondary property tax would have on residents, if passed. The section of Waddell Road (175th Avenue to Cotton Lane) is clearly a gap in the city’s transportation network. It is incomplete with multiple lanes being forced to merge into a single lane, it’s missing sidewalks, street lights, stormwater mitigation, and other design features included in a complete street. However, the bigger need currently is the section of Waddell Road between Cotton Lane and State Route 303. It has been fully-built out and traffic counts are approximately 35% greater in this section than in the section between 175th Avenue and Cotton Lane. The Surprise City Council approved funding to support the Neighborhood Grant Program that provides eligible neighborhoods with small grants to fund neighborhood events, functions or even some community improvements. 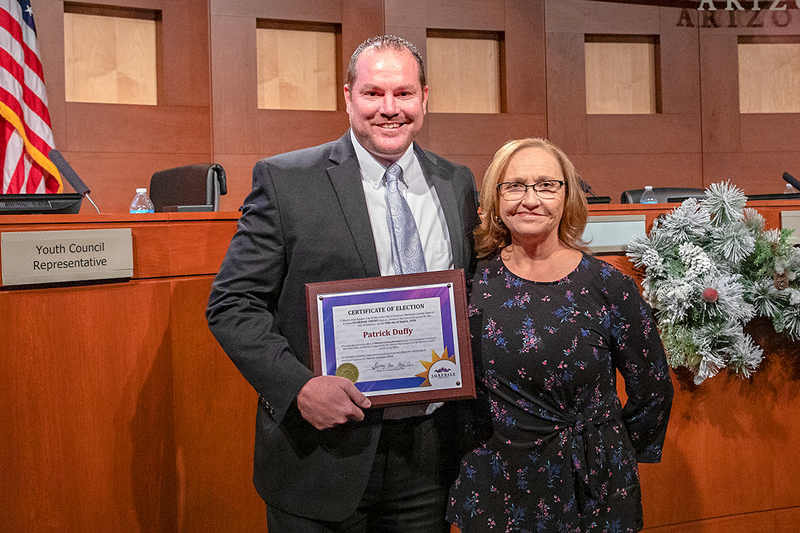 Recognizing an opportunity to encourage community engagement and further build strong relationships with communities in Surprise, the city designated $10,000 to support the grant program for FY18. Additionally, a minimum of five neighbors within the residential area must sign the application and support the idea. Neighborhoods governed by a homeowners association (HOA) must have HOA approval. Interested communities should deliver the complete Neighborhood Grant Program application to City Hall, attention Jodi Tas, by 5:00 p.m. on Friday, November 10. For more information about the grant, visit Neighborhood Grant Program or contact Jodi Tas, 623.222.1330. On Tuesday, November 7, Surprise residents will consider three separate General Obligation Bond questions to fund 10 capital improvement projects in the areas of Public Safety, Traffic Congestion Mitigation and Pavement Preservation. You can see what the projects would look like, and what needs they would address, in three new videos that cover each of the bond questions. The videos are available on the Decide Surprise website at www.surpriseaz.gov/decidesurprise. Also on the Decide Surprise website, find information on the projects and the associated costs. If any of the bond questions are approved by voters in November, the cost to residents would be administered via a secondary property tax. Currently, Surprise does not have a secondary property tax. If you prefer to drop your ballot off, rather than mail it, ballot drop-off is available at Surprise City Hall – City Clerk’s Office now through Election Day! If you lost your ballot, replacement voting begins Saturday, October 28 through Election Day, Tuesday, November 7. The Clerk’s Office will be open for ballot-drop off or replacement voting 8 a.m. – 5 p.m., all week, including weekends, and offer extended hours on Election Day, Nov. 7, of 6 a.m. – 7 p.m.
Again, I look forward to serving you. 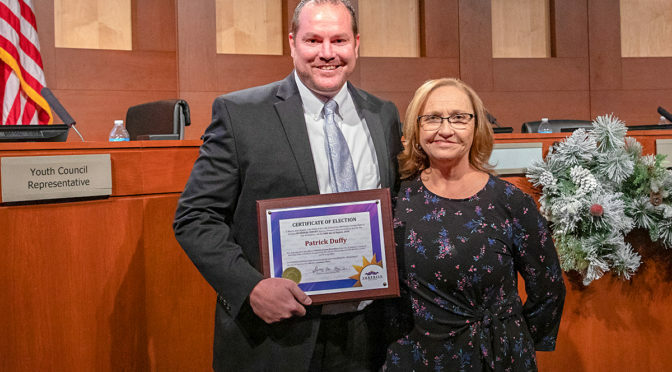 Please feel free to reach out to me at patrick.duffy@surpriseaz.gov or 623.222.1323. Additionally, you can connect with me on Twitter at @Surprise_D3 and Facebook at www.facebook.com/profile.php?id=100022175423875. Happy New Year and thank you! With the beginning of a new year and the closure of another year that just passed, comes reflection. I feel an overwhelming abundance of gratitude to my district for their confidence in re-electing me to my third term. As I took my Oath of Office earlier this month, I can’t help but express my gratitude for all of the experiences, opportunities and friendships that this position has afforded me. This past year was quite busy and successful for Surprise. Last year began with residents and businesses enduring an eight-month closure of Bell Road. Lucky for us, Bell Road re-opened as promised and on-time. While construction on Grand Avenue continues, the project is scheduled to be completed by the end of February! Final paving is still being done on eastbound Grand Avenue which will require simultaneous closures of Towne Center and Bell Grande Drives at times over the next few weeks; businesses in the area can still be accessed using Bell Road during the intermittent closures. Next weekend, pavement work on Bell Road will require westbound Bell Rd to be closed between 134th Avenue and West Point Parkway from 9 p.m. Saturday, January 28, to 5 a.m. Monday, January 30; eastbound Bell Road will be open. The city created a map so you can familiarize yourself with the Bell Road Bridge and Grand Ave Traffic Patterns before the project is complete in February! You can also view the ADOT Bell-Grand interchange animation to better understand how movements will occur using the Grand Avenue ramps. Within District 3, Cactus Road was a huge improvement for folks on the southwest side of town. Residents of Sara Ann Ranch will benefit greatly from this roadway improvement as they are no longer limited to one access point in and out of their subdivision. This also adds another path to access Shadow Ridge and Paradise Honors High School. Development is on the move in this area, and we look forward to continued roadway improvements in and around this area, as well as an increase in residential and commercial development. Another success this past fall was the successful partnership endeavor between the City and Gateway Community College. 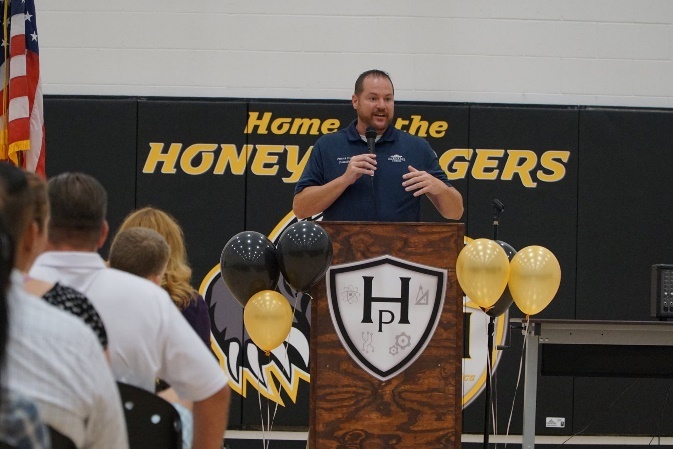 The new 13,100 square foot facility officially opened its doors in October. 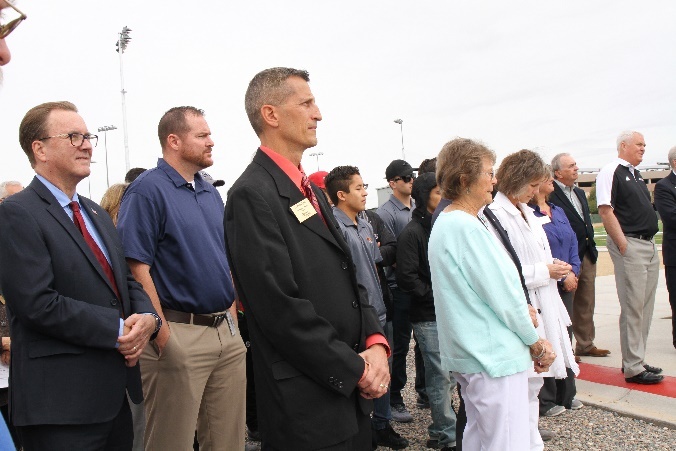 The observation-centric training facility provides individuals interested in pursuing careers in the water and wastewater professions with new opportunities for hands-on learning in the West Valley. 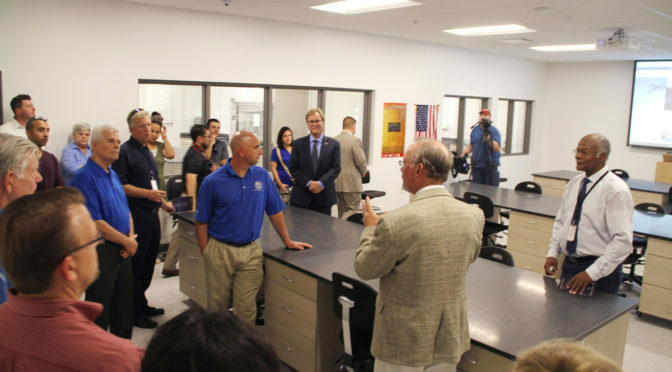 It also provides mission critical labs and assembly facilities for city water professionals. The center is located on the grounds of the South Plant (SPA1) Water Reclamation Facility – a facility that currently processes over 8 million gallons of water per day. Over the last few months, you’ve probably noticed several new businesses and restaurants opening across our city. 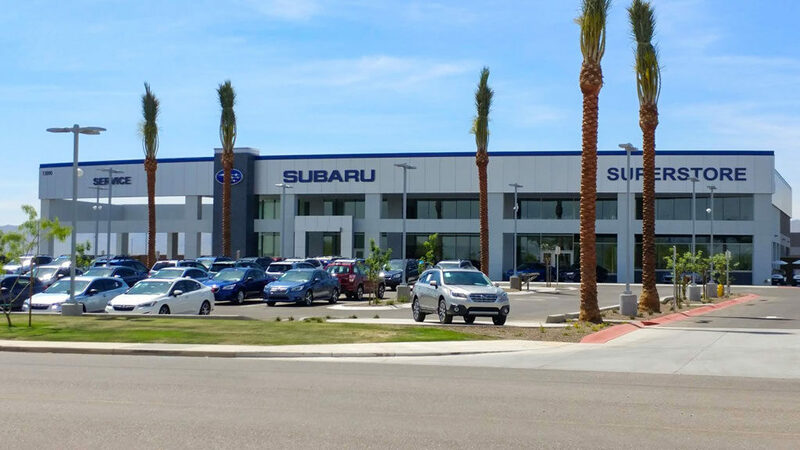 Some of our District 3 openings include Surprise Honda, Rodeo Hyundai and our soon-to-be-opening businesses include a new Subaru dealership. 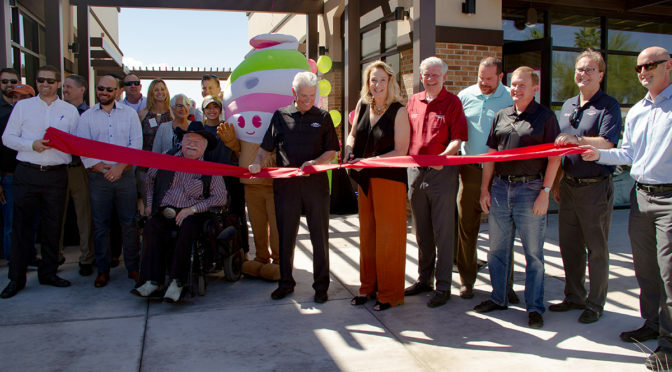 Other new businesses and restaurants include State 48, Oregano’s, Dunkin Donuts (Waddell and Litchfield Roads) CrossFit SPADE, Redline Grill and Mom’s Fixins (northeast corner of Bell and Reems roads), Dickey’s Barbecue Pit (Bell Road and Loop 303) Caliber Collision (southwest corner of Bell and Dysart roads). 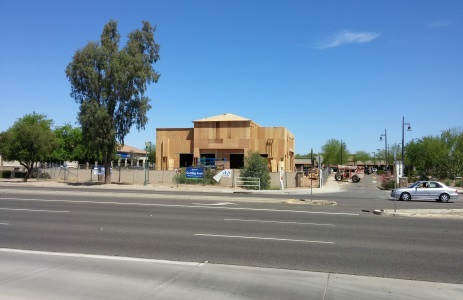 Panda Express (northwest corner of Waddell Road and Loop 303) and Firehouse Subs (northeast corner of Bell and Litchfield roads) will be opening soon. Sierra Montana is scheduled to receive Crack Sealing and a Type II Slurry Seal on the residential roads of Parcels 1-3, 8-12, 14-16, and 18-20. Sierra Montana is additionally scheduled to receive Crack Sealing and a Type II Rubberized Micro Surfacing on the collector roads of Verde Vista Drive and Sierra Montana Loop. Current status shows Crack Sealing has commenced and is progress in the residential areas and will continue through the winter. Residential Slurry Sealing will commence in spring 2017. Upon completion of the Residential Slurry Sealing, Rubberized Micro Surfacing will follow on the collector roads scheduled. Greer Ranch is scheduled to receive Crack Sealing and a Polymer Master Seal on the residential roads of Parcel 12,14,15,18-21, and Phase 1 and 2 North. Current status shows Crack Sealing has commenced and is in progress in the residential areas and will continue through the winter. Residential Polymer Master Sealing will commence in late Winter 2017. Greenway Parc/Legacy Parc is scheduled to receive Crack Sealing and a Type II Rubberized Micro Surfacing on the collector roads of Custer Lane from Reems Road to Legacy Parc Blvd and 156th Avenue from Acoma to Custer Lane. Current status shows Crack Sealing and Rubberized Micro will commence on these collector roads in late spring 2017. The City of surprise received a request to Annex approximately 203 acres of property within a County island generally located between Cotton Lane, 175th Avenue, Waddell Road and Cactus Road, along with the request for a Planned Unit Development neighborhood known as Magnolia. The proposed Magnolia project, if approved, will accommodate up to 900 residential lots with an overall density of approximately 5 dwelling units per acre which is consistent with development in and around the area. This project was recommended for approval by the Planning and Zoning Commission and will be on the agenda for consideration by Council on the January 17, 2017 City Council meeting. 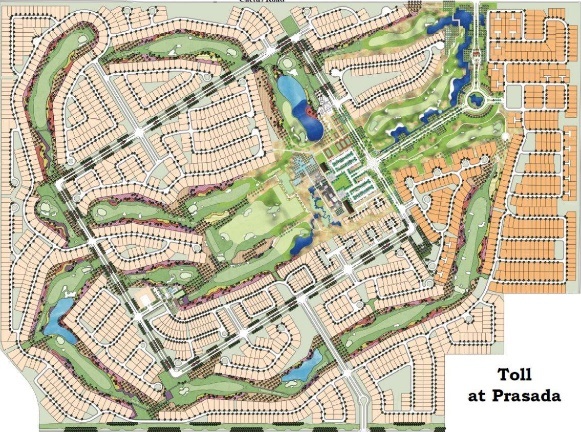 The City of Surprise approved the 3,355 acre Prasada Planned Area Development (PAD) on June 22, 2006. 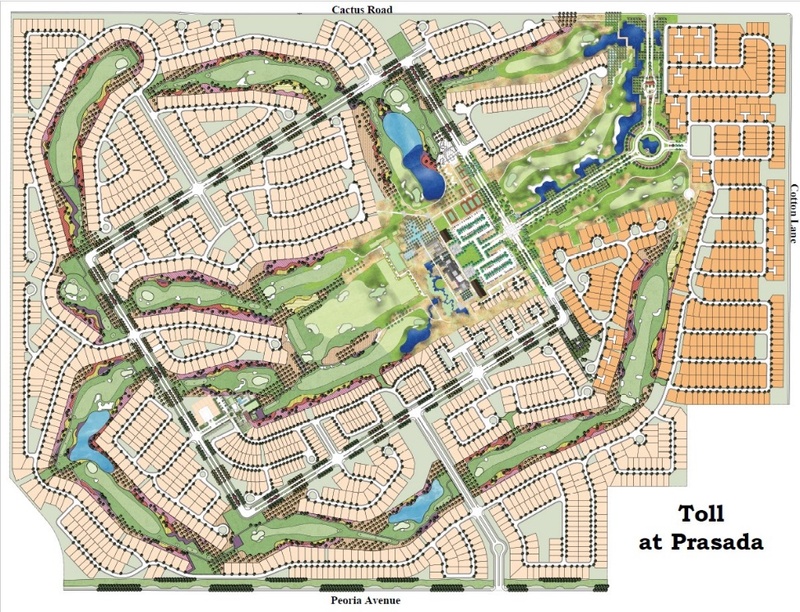 The Prasada development included three distinctive areas: the 1,225-acre Gateway Village along the Loop 303 corridor; the 530-acre Urban Village located between the Gateway Village and Marley Park; and the 1,600-acre Lake Village west of Cotton Lane straddling Cactus Road. 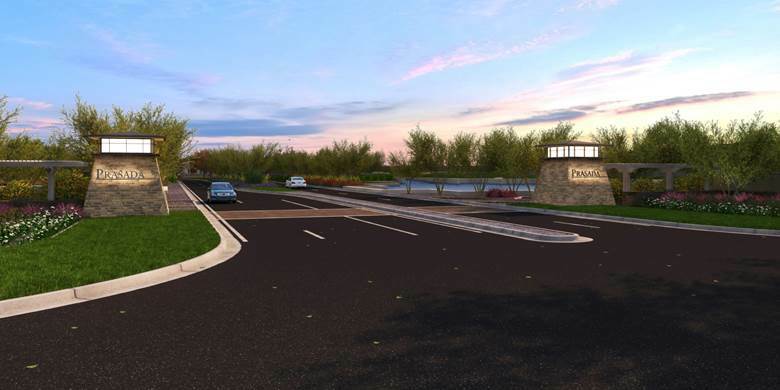 The Prasada Lake Village plan included lakes, themed parks, three elementary schools, and a “rural edge” concept along Waddell Road to provide a transition between the rural nature on the north side and the more suburban nature of the Prasada Lake Village. At the time of the Prasada Zoning, there was a development partner that would master develop the Prasada Lake Village; they have since moved on from this project and are no longer the master developer. In order to market the property to prospective developers, the property owner requested minor changes such as removal of the themed parks but maintaining the minimum 15% open space; addition of four additional architectural types to the architectural theme: Craftsman, Ranch, Cottage, and Farmhouse; and possible dedication of lands for a City-owned and maintained park in accordance with the Surprise Parks and Open Space Master Plan as well as other minor modifications. This project was approved by staff. The developer is proposing to amend the zoning of just over 29 acres of the 879-acre Zanjero Trails Planned Area Development (PAD) located near Peoria Avenue and Perryville Road. The amendment will modify the land use of two parcels from Multifamily Residential Commercial to Single Family Residential. A Citizen Review meeting was held at City Hall on January 12 for resident input. Along with this proposal, a preliminary plat is intended to initiate the platting process of the proposed amendment for Zanjero Trails. The plat encompasses just over 30 acres and proposes 103 residential lots over 6 acres of open space. The developer is proposing to amend the zoning of the Sycamore Farms Planned Area Development generally bounded by West Cactus Road to the North, North Sarival Avenue to the east, West Peoria Avenue to the south, and North Cotton Road to the west. The amendment encompasses just over 266 acres of the overall 637-acre development. On September 14, 2016 the developer held a citizen review session for residents to attend and provide comments on the proposal. 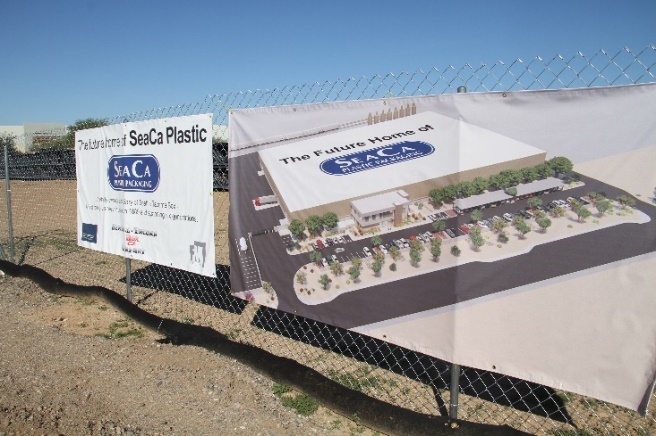 The changes requested are located in the southeastern corner of the development and involve the reorientation of the large commercial land use (Sarival Ave and Peoria Ave). The applicant has proposed to reorient the commercial parcel to face Peoria Avenue instead of Sarival, reallocating open space and modifying commercial setback lines. 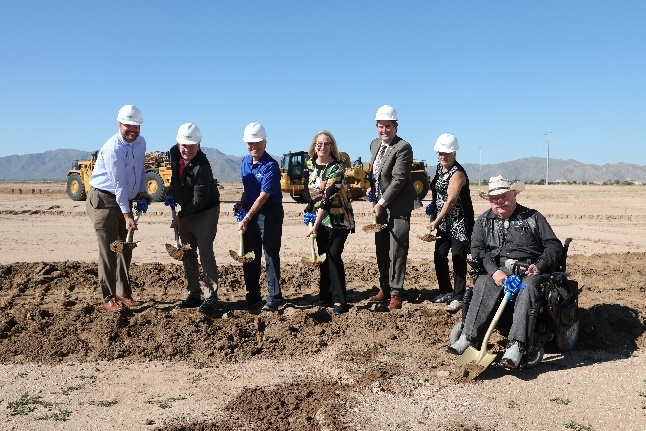 The open space modifications include reorienting the proposed 50-acre park to be relocated closer to the northwestern corner of the development (Cactus Road and Cotton Road). Public trails and neighborhood parks will be located throughout the eastern half of the development to provide pedestrian connectivity and adequate amenities for the residents. The northeastern corner is proposed to be redesigned to provide a diverse land use (including commercial, medium-density and low-density residential) that work together around a proposed central park that will provide many opportunities for recreation. Currently, much of this land is designated as mixed-use and is loosely defined in a way that provides flexibility that could either increase creativity of design or allow land uses to locate next to each other with little concern with compatibility. At the January 19 Planning and Zoning Commission meeting, the project was recommended for approval to the City Council. The City Council will hear this item at the February 21 City Council meeting. Neighborhood Watch groups can be a powerful tool for combating crime in one’s neighborhood. The program teaches citizens crime prevention techniques to reduce the risk of being victimized at home or in public. Additionally, Neighborhood Watch encourages residents to form a group of concerned residents who work together to become the eyes and ears of the police department. The first step in putting together a neighborhood watch is to talk with your neighbors and gauge the level of interest they have in forming a group and seeing it through. Neighborhood Watch is only as effective as the residents make it. If there are 10-15 interested residents, you may have the strong core of a Neighborhood Watch. Your next step would be to contact the Surprise Police Department’s Community Relations and Crime Prevention team at 623-222-4422 to setup a time and place for the training. Additionally, the social media site Nextdoor (www.Nextdoor.com) is a virtual extension of the Neighborhood Watch program. Nextdoor allows residents to communicate amongst themselves and allows your police department to share important messages. Signing up for Nextdoor is a great way to meet other safety conscious residents in your community. Surprise Police Department will host a Shred-a-Thon and Drug Take Back Event on Saturday, January 21, 2017 from 7 until 10 am. This event will be held at the Surprise Public Safety Building located at 14250 West Statler Plaza. During the event, public will be able to bring up to 3 boxes of documents per vehicle to be shredded. Additionally, unused prescription and over-the-counter medications can be brought and dropped off for destruction. There is no cost for the shredding of documents or destruction of medications. Please note that we are unable to accept sharps (to include insulin syringes/needles) or inhalers of any kind. Additionally, the shredding event will continue until 10am or until the shred trucks have been filled up. The public is encouraged to attend the AZ Military/Veteran Resource Navigator training February 9 in Surprise City Hall Community Room. The training, conducted by the Arizona Coalition for Military Families, is meant to train all people who wish to help service members, Veterans and their families by connecting to a network of services. There are two trainings on Feb 9. The first is from 9 a.m. to noon, and the second is from 1:30 p.m. to 4:30 p.m. Registration is required. To register, please email deborah.perry@surpriseaz.gov. The City will be hosting another City Academy beginning March 6, 2017. The Academy is an opportunity for residents, students and business owners to learn about our city directly from City Council and city management. Classes meet weekly from 6 until 8:30 pm in the Surprise Public Safety building (14250 W. Statler) through April 17. For more information or to register, please contact Ruby Sitea at ruby.sitea@surpriseaz.gov. Free Tax Assistance is available through the Volunteer Income Tax Assistance program run by New Leaf, and we will have these services open to the public beginning the week of January 23. 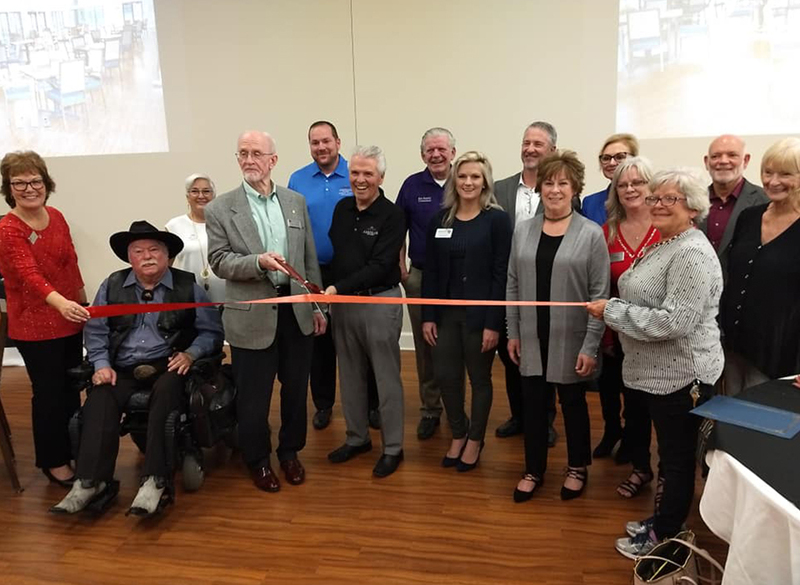 Tax assistance will be offered at the Surprise Resource Center on Mondays from 4-8 p.m. and Thursdays from 9 a.m.-1 p.m. and at Riverboat Bingo on Wednesdays from 11 a.m.-3 p.m. Free tax services will also be offered at the Surprise Senior Center on Tuesdays, from 4-7:30 p.m.
Grant applications for the Community Development Block Grant (CDBG) are now available on our city’s website for non-profit organizations who wish to seek funding to support Surprise residents through a variety of public services. Applications are due on January 25. For more information, please visit www.surpriseaz.gov/2616/CDBG-Public-Service-Grants. Get Fit in 2017 at the Surprise Senior Center! Did you know that the Surprise Senior Center has a Health & Wellness Initiative that includes a gym membership and exercise classes? Annual Fitness Memberships at the Surprise Senior Center are $30 per year for residents. Senior Center membership is only $12 per year. Come enjoy programs like Silver Sneakers, Fitzi with Mitzi exercise classes, Stepping It Chair Exercise, the Walking Club and Coed Volleyball for Seniors. The Surprise Senior Center is a hub for activities and programs for adults, age 50 and better. The Center offers a place for people to gather, learn, exercise, socialize and enjoy a delicious and healthy hot lunch. For more information, call 623-222-1500. Please remember that the block party trailer is available to reserve at no cost! If you are interested in hosting a block party and would like to utilize the trailer, information can be found at www.surpriseaz.gov/869/Block-Party-Trailer. This October, seven members of the City of Surprise Youth Council (SYC) attended the National League of Cities Summit in Pittsburgh, PA. This event allowed them the opportunity to learn from national leaders and experts on issues of economic development, technology, and sustainability, as well as important cultural and social issues. Through a series of workshops and seminars, SYC members were also able to share their own experiences and perspectives with other youth councils from around the country. This exchange of ideas had a major impact on our youth and allowed them to bring home a host of new ideas and best practice strategies which will help them develop their leadership skills for the betterment of our Surprise community. 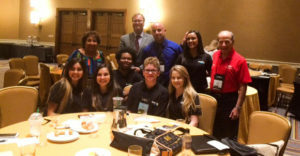 They performed so well during these sessions that they have been asked to nominate an SYC member to serve on the National League of Cities Youth Planning Committee; a great honor for the youth of Surprise. Over the last few months the City of Surprise Youth Council has been working hard to help local youth expand their opportunities, develop their leadership skills, and prepare for successful and healthy futures. After undergoing a series of trainings with BLOOM 365, a nonprofit dedicated to fostering healthy relationships, SYC members are now ready to begin delivering peer-to-peer dating violence awareness trainings in local Surprise high schools. With the support of local schools, this project has the potential to positively impact thousands of local teenagers. Dating violence is an unfortunate, but important, issue that the SYC is willing to address directly, in order to help prevent local teenagers from being victimized or abusing others. The BLOOM 365 project is just one of the many creative ways the SYC is seeking to expand its impact beyond its own membership. The group has shown its support for local veterans and teachers by marching in the Surprise Veterans Day Parade and holding a school supply drive for local teachers. The SYC will also be hosting a free SAT training for local high school students at the Surprise Library on January 28, and is currently developing a blog that will allow local teens to share resources and discuss important local issues with one another. All of these endeavors help us to reach our goal of helping local youth find greater success in the classroom, in the workplace, and in the community. 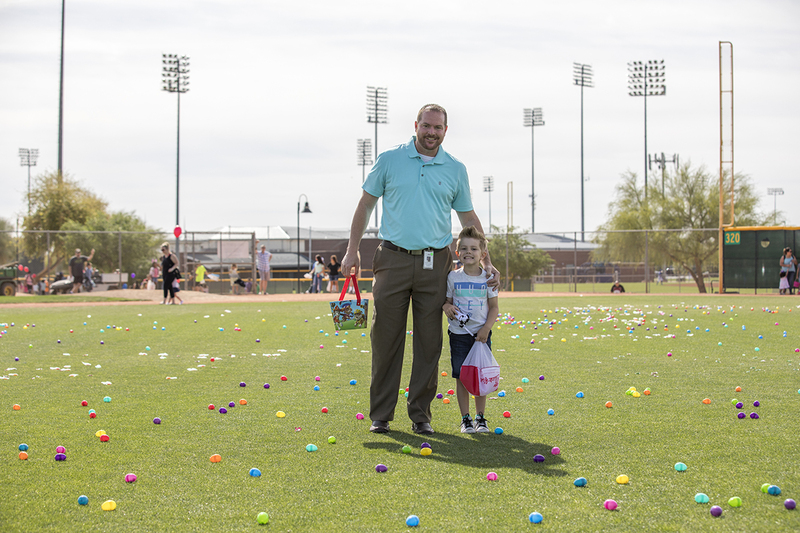 Check out the following lessons and classes available through the Community and Recreation Services Department, and get additional information at www.surpriseaz.gov/recreation. Register for this 4-week session that meets on Tuesdays at 1 p.m. in February and March for 45 minutes each week. Class will focus on FUN interaction between parent and child. Perfect way to spend quality time with your child and meet new friends while developing the love for tennis. This program is for ages 2-4 years old. Calling all HIGH SCHOOL Tennis Players both Varsity and JV! Are you ready for the 2017 Season? Do you need to tune up your game? 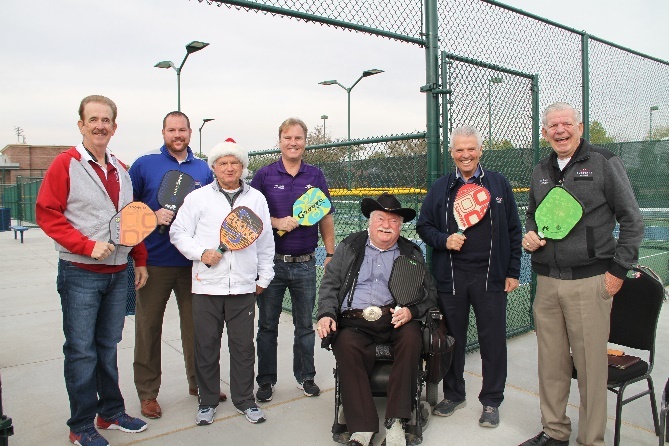 Then play at the Surprise Tennis & Racquet Complex on Tuesday nights from 4:30-6:30 p.m. Each week, 3-time AZ State Tennis Champ Max Schell will run half-hour drills to get you warmed up. Then, put your skills to the test in doubles or singles play against other local players. ALL LEVELS are welcome, and the fee is $2 for Surprise Residents and $3 for non-Surprise residents. Looking to learn a new sport or just get in shape? Then try racquetball! The cardio benefits are excellent! This new program is for adults 18 & over. Classes are forming now. Drop-in Paddleball – Monday Nights! Paddleball Drop-in is every Monday night from 5-7 p.m. Not sure what paddleball is? Don’t worry! All levels are welcome, and equipment is available for you to try it! This fun game and great workout is for adults 18 & over and the fee is $2 for residents and $3 for non-residents. Adult Development – NEW TENNIS CLINIC on SATURDAYS at 9 a.m. This 90-minute well-rounded clinic is for the 3.0 and “returning to the game” players who are looking for a coherent path to better tennis. Players will work on skill development and then learn how to utilize it in game situations. Girls Volleyball League – NEW SEASON DATES The youth girls’ volleyball season will teach the game of volleyball in the spirit of sportsmanship, fun and wholesome competition. An emphasis is placed on the development of skills and the value of teamwork. The road to the “Big Leagues” starts here! This program offers youth the opportunity to learn the basic fundamentals and skills associated with the game of baseball and softball in an atmosphere where participation and fun are top priority. 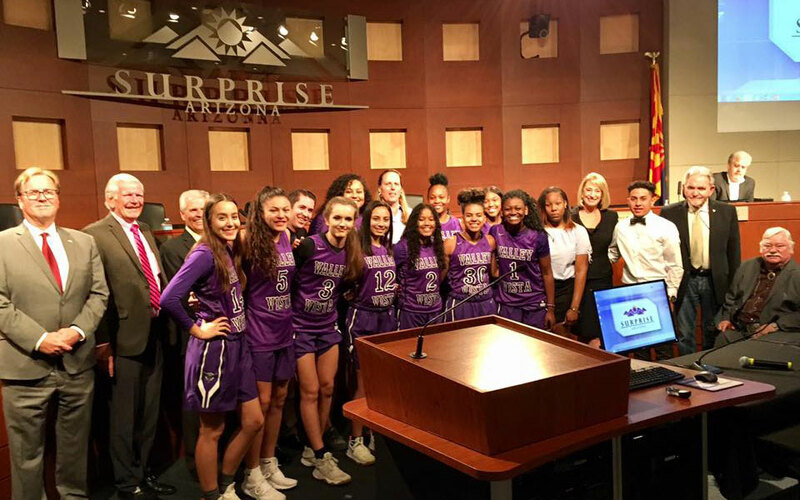 The City of Surprise has designed the Competitive Sports Program to provide youth athletes with the opportunity to participate in an organized, local league that will introduce them to the competitive side of sports relative to playing time, rules, standings and player development. 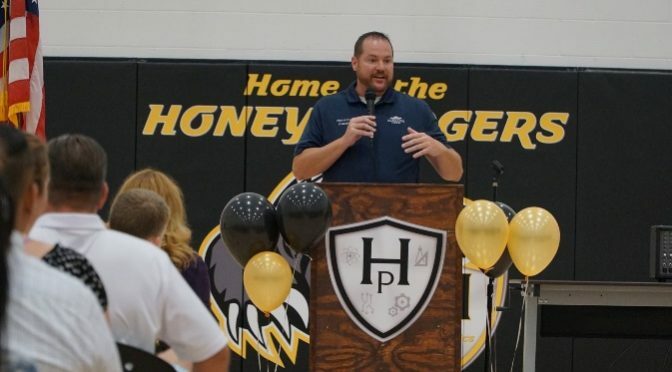 While emphasis will remain on basic fundamentals, sportsmanship, and cooperative participation and socialization with peers, this program differs from recreational sports in that there are NO MANDATORY PLAYING TIME RULES. The Competitive Sports Program will follow modified NFHS rules, and is intended for experienced players only. Participants will go through a skills evaluation and will be drafted onto a team. Special requests are not honored in competitive programs. Teams will play 7 league games and participate in a single elimination tournament to conclude the season. Geared for beginner to advanced bike riders. This course will cover proper helmet wearing, mounting / dismounting, braking techniques, riding on the road, setting up your bike, chain resetting, basic maintenance, and shifting techniques. Course is taught by a Police Department Bicycle Safety Course graduate. This course is best suited for multi-gear bikes, but can be used for BMX and single gear as well. Bring a bike, helmet, and wear closed toed shoes and wear appropriate clothing. Riders must be able to ride a bike well before entering this class. Learn beginning to advanced techniques for the 4 and 5 string bass guitar and how to utilize them in a band situation. Students must provide their own bass guitar. Defense is much more than knowing how to fight back against a physical attack. Our class will encourage participants to think about their choices, help them develop awareness, and provide a friendly environment for practice of physical self-defense techniques. We will help participants expand the way they think about violence prevention, help them confront their fears and enable them to be more empowered and assertive. The class will teach students the basics that they need to begin playing the ukulele. They will focus on chords, single notes and rhythms. Students will learn the parts, care and notes on the ukulele and how to read rhythms and chord charts. By the end of class, students will have learned techniques and information that will allow them to play 3 chord songs and continue learning on their own. Please bring a notebook and ukulele. Join the biggest game of outdoor laser tag in Surprise. Teams are encouraged to crawl, scoot, sneak, hide and move throughout the park to claim the title of laser tag champion. All participants must have a participation waver completed and turned in before being eligible to play. Teams of 6 or free agents welcome. Compete with teens from all over Surprise in the classic P.E. game Capture the Flag, except you will be wearing a bubble. Be prepared to knock your opponent out of the way and roll down the field to glory in the ultimate game of capture the flag! All participants must have a participation waiver completed and turned in before being eligible to play. Teams of 8 and free agents can register. The tournament will be co-ed. April 8 – Children will enjoy dancing, crafts, stories and a tea party with storybook characters. Tickets may be purchased at the Community & Recreation Services Department for $5. May 12 – The City of Surprise is looking for its most talented residents! If you can sing, act, play an instrument or perform what you think is a talent (must be safe) then come and show off your skills. Registration forms must be received by April 7. Those that make the cut will perform in the Talent Show on Friday, May 12 at Valley Vista Performing Arts Center. The show will be split into age groups: youth, teen and adult. The audition forms are on the following website: www.surpriseaz.gov/recreation or can be picked up at the Surprise Community and Recreation Services Office. There is no fee to audition or be in the talent show, and friends and family are welcome to purchase a ticket. Admission tickets for the Talent Show are $3 advanced purchase and $5 at the door. The 4th Annual Taste of Surprise will showcase some of the West Valley’s best local restaurants. Several bands and a former American Idol contestant are part of the music line-up. 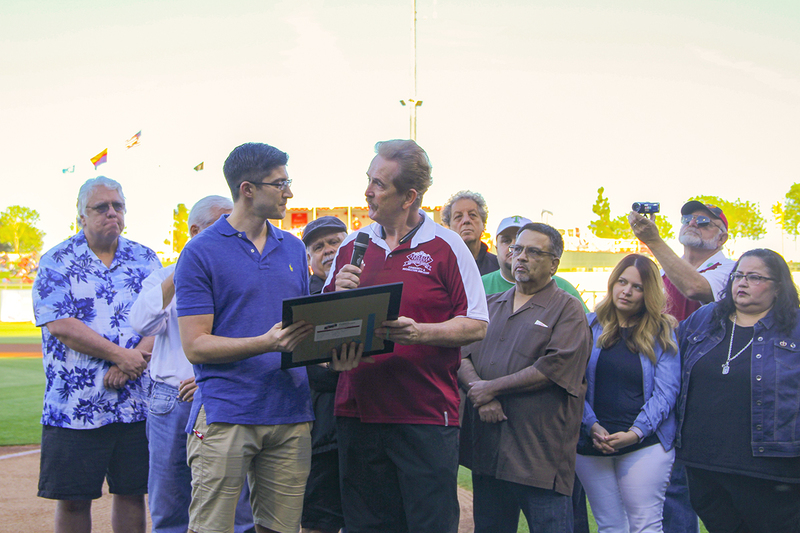 This year’s event will take place at our very own Surprise Stadium on Saturday, April 8 from 4 until 9 p.m. All proceeds from the event will benefit selected Surprise non-profit organizations. You can purchase your tickets for $25 each at www.tasteofsurprise.com. I will host quarterly community meetings throughout the year. The format will allow residents to engage in conversations with various departments and, in some cases, businesses and developers, and it will ensure we are all in the “know” on how our city is progressing. The first meeting of the year will be held on February 22 at 7 p.m. in the Community Room at City Hall. Developers from Prasada will be in attendance, as well as various city departments! I hope to see you there! This year promises to be exciting in Surprise! It has been an exciting year for Surprise, and I believe the future is more promising than ever before! Why? The entire City Council, along with City Manager Bob Wingenroth, has strategically positioned the city for that success. We continue to see our city grow, not just in population, but in economic development projects. Several new businesses have opened, broke ground or announced their desire to be here! 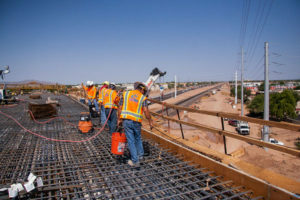 With the completion of Loop 303 last year and the construction of the Bell Road bridge, I anticipate Surprise will become more and more attractive for other future businesses. Several restaurants have or will soon open their doors. Newly opened restaurants include Biscuits Café located off Bell Road near Grand Avenue, Jamba Juice located east of Litchfield Road on Grand Avenue, and Under Review is open next to Uptown Alley at Waddell and Litchfield roads. State 48 Brewery and Oregano’s, both located on Bell Road should be opening soon! As for District 3, we have three new businesses under construction. Those businesses are Aspen Dental, Surprise Honda and Surprise Hyundai. I look forward to having our new additions soon! 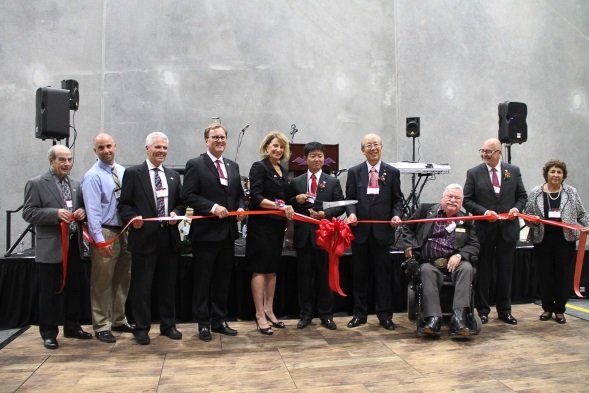 The city also welcomed a new international business in May – IRIS USA. 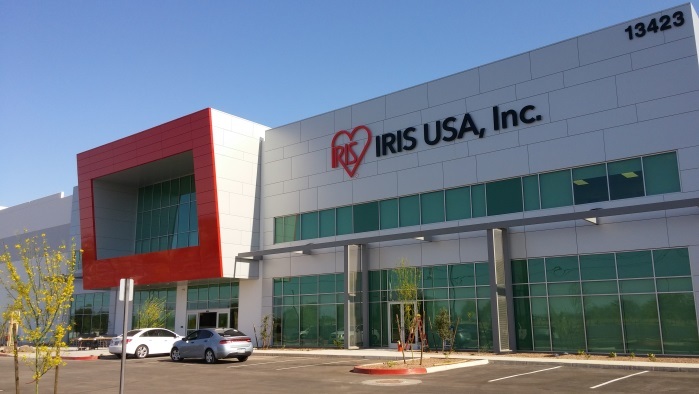 IRIS USA built a 400,000+ square foot building on 30 acres to serve as its North American Headquarters in Surprise’s Southwest Railplex Industrial District. They are employing 100 people. The city is expecting $800,000 in revenue during IRIS’s first year of operation. Additionally, Mainstreet, a $20 million hotel-like medical recovery facility will open their doors this year bringing additional head-of-household jobs to our city. We are also working hard to grow our downtown at City Center! Earlier this year, City Council voted unanimously to negotiate a formal settlement agreement with Surprise Center Development Company (SCDC). In a May 5 Special Meeting, the Surprise City Council unanimously approved a settlement to end litigation between the city and (SCDC), which owns most of the land around the Civic Center Campus at Litchfield and Bell Roads. 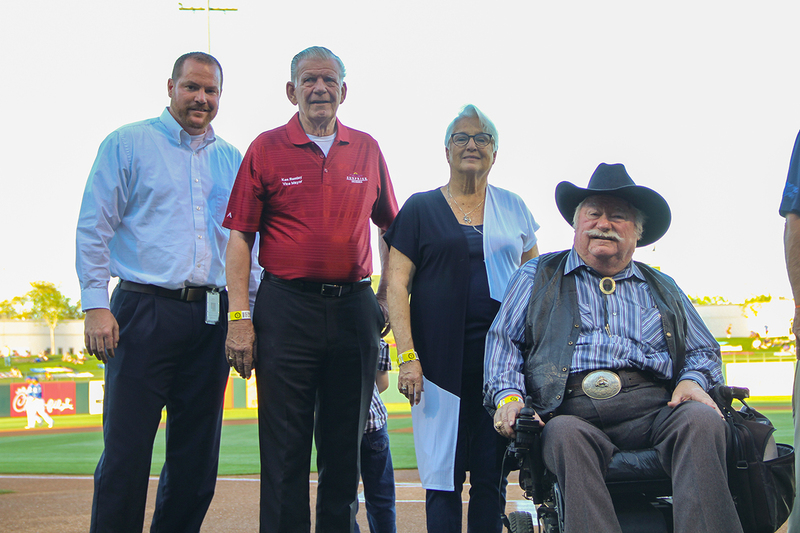 Both parties are pleased to have come to terms on a settlement which achieves a full and final release of claims and believe this solidifies a partnership that will result in the development of a vibrant and engaging city center in Surprise. 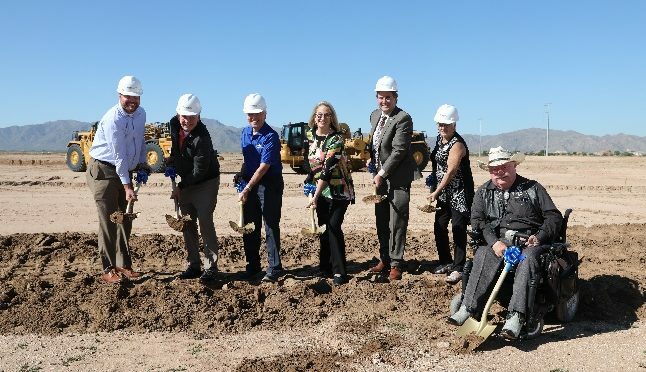 The city, in partnership with Gateway Community College broke ground on the future-site of the Surprise-Gateway Training Center, a facility that will provide new, mission critical labs, assembly facilities and classrooms for the city water professionals and individuals interested in water resource management careers. 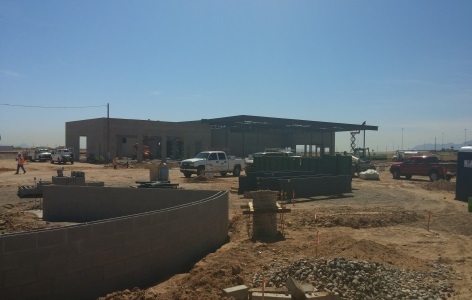 The 13,100 square foot training center is being constructed on the grounds of the South Plant (SPA1) Water Reclamation Facility, located near the intersection of Cactus and Litchfield roads. SPA1 currently processes over 8 million gallons of water per day. Construction of the Center is anticipated for completion this summer and training opportunities should begin as early as this fall! 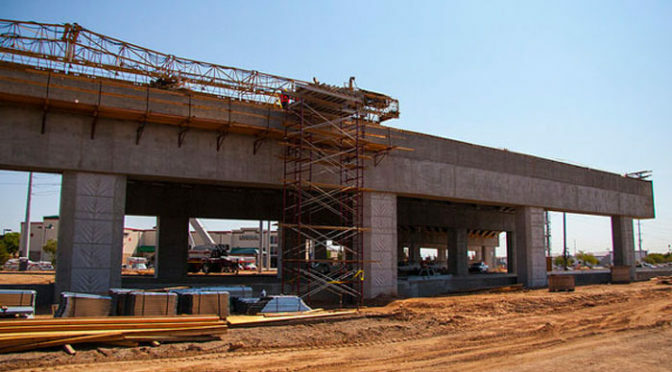 City transportation projects continue to progress this spring and into the summer. For your reference, below is the most updated status for the projects impacting District 3. Greenway Road Widening – This project is 85% complete. The first lift of asphalt paving is complete. The final paving cap will be placed following the completion of the landscaping. The landscaping and decorative paver placement is estimated for completion in late May. All of the contractors’ activities are being closely coordinated with the Bell/Grand detour plan in an effort to minimize traffic interruptions. The westbound lanes will be open in June. Cactus & Litchfield – Construction on Litchfield Road is complete and the road is open to the public. Cactus Road construction is expected to start at the end of June once APS relocates 69KV power poles. Landscape Medians – Construction has begun on Bullard and should be complete by the end of May. Reems Road construction has begun and should be complete by July. Peoria Avenue (south half) – Plans are still in final stage of revision. Once plans are approved, bids will be advertised. Construction is expected to begin in late June and should be complete by end of August. Cactus from Cotton to 175th – Construction will begin in early June and should be complete by the end of July. Bell Road at Grand Avenue officially closed on April 1 which kicked-off Phase 3 of the project which is expected to conclude in spring 2017. Bell Road is scheduled to re-open in November 2016 prior to the holiday shopping season. Access to businesses next to the project area will be maintained throughout the project. The main detour from Bell Road is southbound Dysart Road, to Greenway Road, and north again on Litchfield Road to re-access Bell Road. Our transportation team tells me this is the quickest and most efficient way around the Bell closure at Grand. Driving through the nearby neighborhoods will not save you time. There has been an abundance of activity and progress since the closure. For continued updates or questions, please contact ADOT’s project hotline at 855.712.8530 (Press option one), or email at bellandgrandinfo@azdot.gov. The city, Surprise Regional Chamber of Commerce, and local businesses have partnered to give you even more reasons to ShopSurprise during the Bell Road full closure. 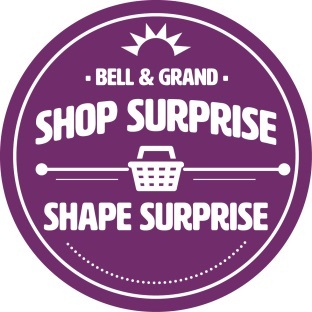 The Bell & Grand ShopSurprise campaign is helping to promote businesses in the Bell Road construction area by offering daily deals for shoppers so they continue to spend money in their hometown. Businesses on all sides of the Bell Road and Grand Avenue intersection are open and have created incentives so that you ShopSurprise! 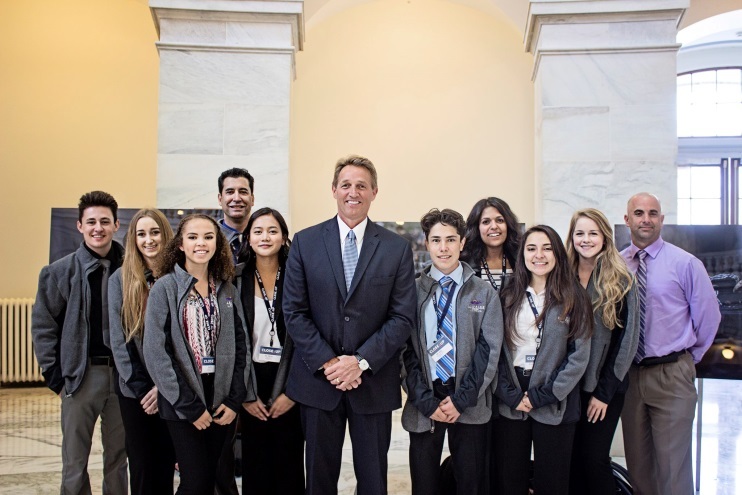 Eight members of the City of Surprise Youth Council attended a week long immersive civic education program in Washington, D.C. (March 13-18) with over 250 other students from across the U.S. The program is done in partnership with Close Up. Close up has a successful 45 year history leading thousands of students from across the nation each year by turning the nation’s capital into a living classroom. Our youth council members discussed current controversial public policy issues (border security/citizenship, criminal sentencing guidelines, related services to pregnant & parenting students, teen voter registration, gun violence in schools, youth obesity, bullying) with peers that have differing viewpoints from their own, learned to gather information from a variety of sources to make informed decisions, and participated in a mock congressional session. The students visited numerous monuments and memorials and talked about how the people and events represented impact their lives today. The program has been proven to positively impact student achievement in standardized testing and encourages long term involvement in activities such as voting, media consumption, and informed political participation. The timing of the trip could not have been better as we find ourselves in a very contentious presidential election. In addition, students were right in the middle of the action when President Obama named his Supreme Court nominee as reporters swarmed around the Supreme Court building while we were there. 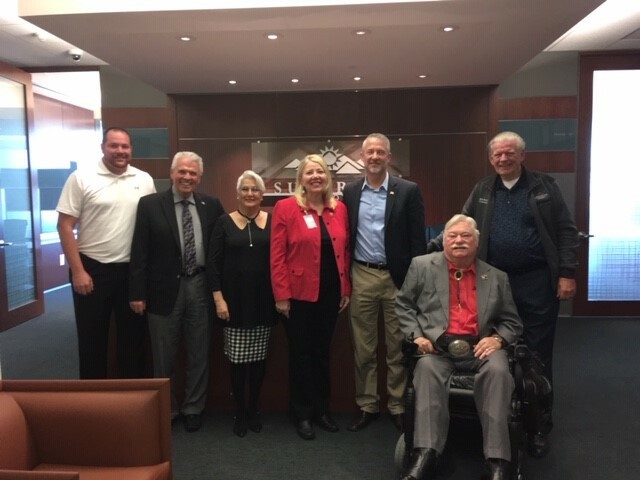 Another highlight of the trip was the opportunity to visit with various congressional leaders from Arizona including Senator Jeff Flake, Congressman Ruben Gallego & Congressman Trent Franks. 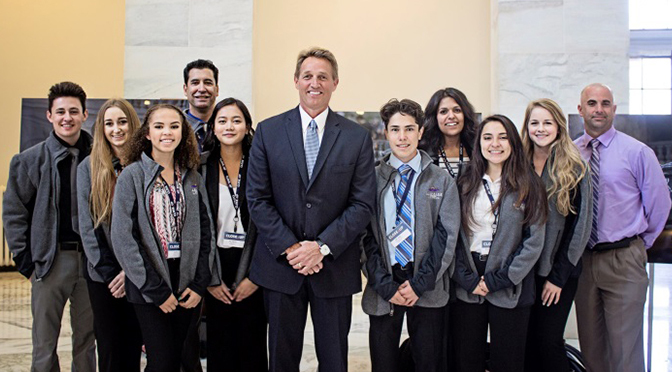 It was an honor for me to join our youth council members for this special Day on the Hill. The Surprise Youth Council (SYC) has launched an awareness campaign “Be Yourself. Find Your Crowd. Get Along.” for teens to help spread the message that everyone belongs. The campaign promotes the idea of finding your crowd and encourages students to break out of their comfort zones and expand their horizons when it comes to making friends. 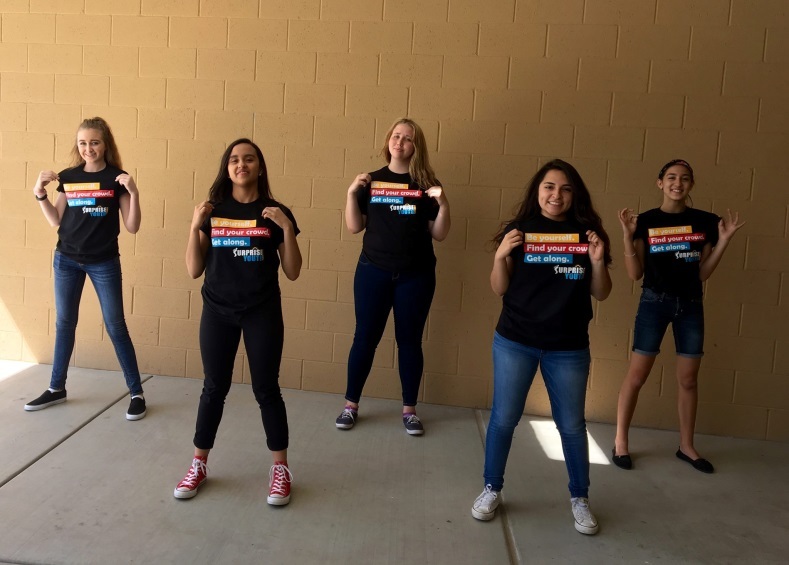 The students are taking their message to local high schools with posters and a video that illustrate the slogan, as well as on-campus activities that encourage teens to live out the campaign concept – such as pledging their support. The campaign message is also creatively displayed in the community. In February, the youth council spray painted a mural themed after the slogan onto a wall near Surprise Stadium. They worked with local muralist Hugo Medina to design the vibrantly-colored public art piece, which depicts human forms participating in diverse activities – activities that represent the “Be Yourself” concept. The council plans to measure the results of the campaign through a student survey that was distributed before the campaign launched and that will be retaken after its conclusion. Follow Surprise Teen Programs on Facebook and Twitter for more information and engagement opportunities throughout the campaign. 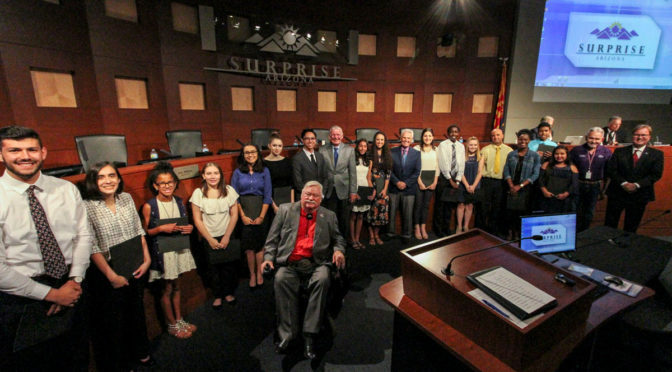 To learn more about the Surprise Youth Council, visit www.surpriseaz.gov/syc. 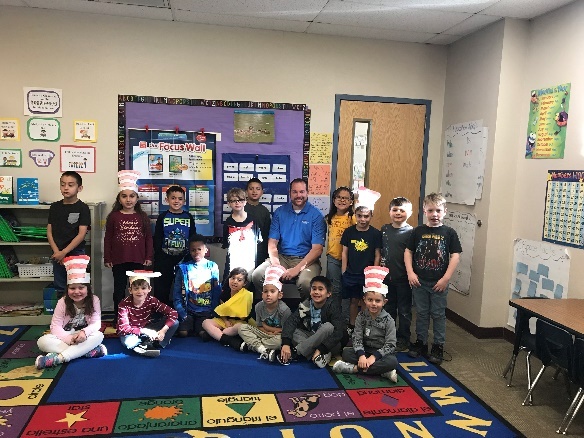 Thirteen schools and 124 classrooms from across Surprise accepted the Surprise Literacy Challenge, a five-month reading challenge last fall. The Challenge, created by Councilman Skip Hall and me, asked students in 4th-6th grade to track the number of hours they read outside the classroom over a three month period. Teachers then reported those numbers back to the city. The winning 4th and 5th grade classrooms were treated to a pizza party and also received a trophy for their room and individual medals for each student at a City Council meeting in April. 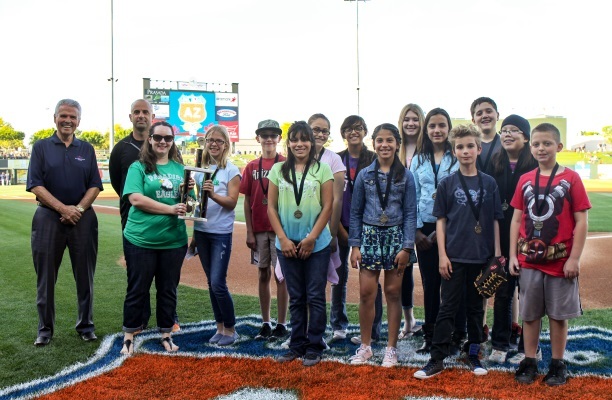 The winning 6th grade class accepted their accolades on the field at the Spring Training game on March 25 at Surprise Stadium. The City of Surprise is offering registration for two recreational Swim and Dive Team programs for youth ages 5 to 17. The Swim and Dive Team program is designed to improve and develop swimming strokes and techniques while offering a fun competitive environment. You can register for either morning or afternoon practice sessions; new participants will be required to try out prior to registration. Drop-in tryouts for new members are being held Monday – Thursday, 4-8 p.m., through May 27 at the Surprise Aquatic Center, located at 15831 N Bullard Ave. Swimmers will be required to swim 25 yards freestyle and backstroke and must demonstrate all four competitive strokes during their tryout. Divers must be able to tread water and demonstrate strong swimming abilities within diving well area. Individual registration fees for swimmers and divers are $80 for Surprise residents and $110 for non-residents. Swim and Dive Team meets will be held at the Surprise Aquatic Center and various Peoria pools. The City of Surprise is hosting a “SCHOOL’S OUT! 3-on-3 Youth Basketball Tournament” on May 13 and 14. Team registration is available for the following youth divisions: 10-12 years old, 13-14 years old and 15-17 years old. Registration forms are available at the Community and Recreation Services office, located at 15960 N Bullard Ave. Team registrations may be submitted by mail or in person to the Community and Recreation Services office, along with a tournament fee of $60 per team of three. Tournament brackets will be available Thursday, May 12 at 5 p.m. Games will begin at 6 p.m. on Friday and 8 a.m. on Saturday. Tournament play will take place at the Countryside Recreation Center, located at 15038 N Parkview Place. For more information on this tournament or additional City of Surprise competitive youth sport league opportunities, please contact Ian Wallace at 623.222.2271 or ian.wallace@surpriseaz.gov. And there is much more! 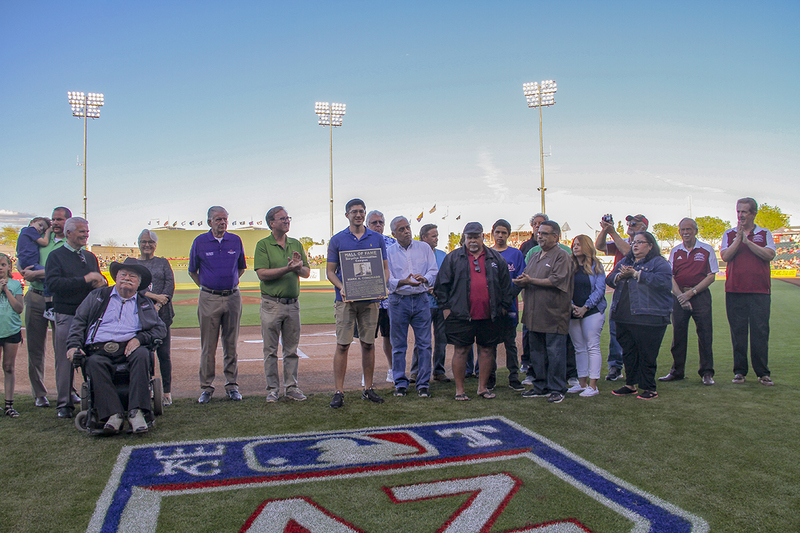 Please visit http://www.surpriseaz.gov/17/Community-Recreation-Services for a list of events. The Council had a detailed discussion on the upcoming budget and how to strategically plan for the ongoing growth of our community. To support our strengths we need to continue to emphasize public safety. Earlier this spring, Public Safety presented to council our anticipated gaps and needs in both Police and Fire. To bring these departments up to standard, staying on top of calls for service and crime mitigation, we will need to infuse $2.4 Million this coming fiscal year. This is a heavy load on our current budget, but with some fine tuning we were able to meet these needs in addition to over $4 million being pumped into pavement preservation. So the real question is, what is “fine tuning?” The council was able to eliminate a contingency fund which opened $1 million, as well as $500,000 in savings from planned personnel savings. This left a gap of $900,000 thousand. As a result, for the first time in nearly a decade residents will see a modest increase in the local property tax (should the council formally adopt its proposed property tax rate on June 21). What does this mean in real dollars? If your home is worth $200,000 you will see an increase of $13.00 annually. If your home is worth $400,000 you will see a total increase of $26.00 annually. There will be no change to sales tax, and our food tax will remain at zero. We felt as a majority that this modest increase, $1-$2/monthly for most residents, will be well invested in a tremendous boost to public safety. For more detailed information on the recommended budget, click here. We next need to consider going to bond for public safety, transportation and recreation infrastructure. Our facilities have not been able to keep up with the growth we’ve sustained. Many of us purchased homes with a promise of what’s to come, and while we’ve grown leaps and bounds, we continue to strive to meet the needs of families and live up to the mantra of live, work, and play in Surprise. On June 21, City Council will vote on whether or not to recommend a $60 million bond package for the November 2016 ballot. I look forward to the discussion and encourage you to get involved. You can attend several Surprise Forward bond meetings in May to learn more. Get meeting dates, a list of potential projects and bond information at www.surpriseaz.gov/surpriseforward. Please stay tuned, and send me your feedback! !